Oh my. This would be a ridiculous upgrade from my Vaio Z Canvas, but a jump to 5lbs @ 15" would be a lot, although I never use my ZC as a tablet, it's always on a desk, so it would just be transport weight. It has 2x NVME slot and 1x 2.5" SATA slot. So it can support up to 4TB SSD plus 1TB HDD. Check out the youtube video posted by Geekzone. Just curious, is the screen aspect ratio not really on your wishlist for tablet features? 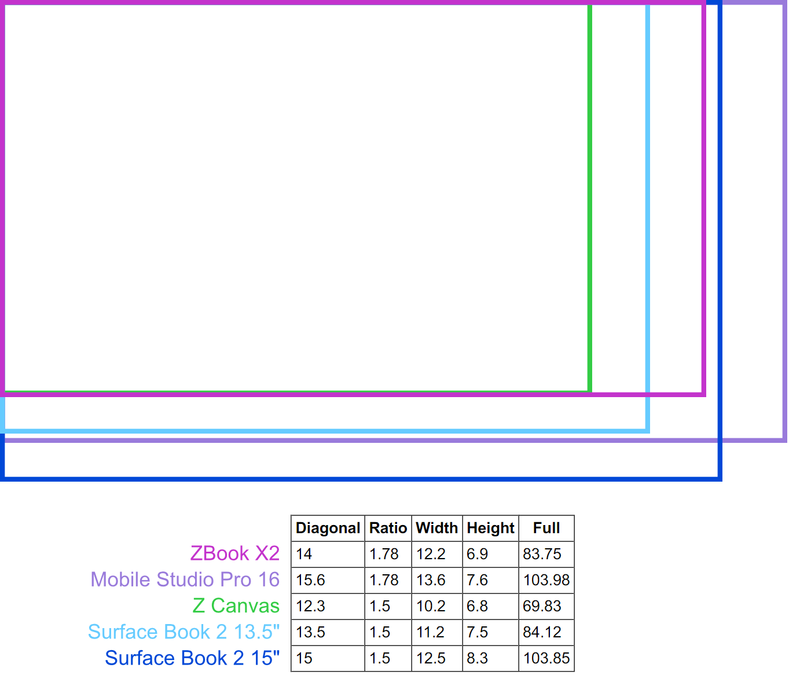 The 16:9 aspect actually the primary reason why I am not getting the ZBX2 (my Z Canvas in 3:2, just is simply too balanced and nice in terms of overall form factor to give up). I get this gripe. If you like the display to be just a big canvas, 16:9 and 16:10 are not up your alley. However, this is the realm of digital art, so there are toolbars to deal with. Especially if you don't have hardware hotkeys (but even then) he extra real estate for them is nice, and you end up with a squarer canvas, albeit not the whole coverage of the display. yes it is. what confuses me though why it only support a max of 5TB (2 + 2 + 1) ? Samsung already have 4TB SATA SSD, so theoretically we can have as much as 8TB of storage. I'm awfully hesitant to go to an AES stylus, but it both being from Wacom and supporting tilt (! how many °? But no rotation?) combined with the raw, workstation-like hardware specs here also have me thinking this is where I'll finally be going for my next Tablet-PC. I'm still absolutely repulsed by the "thin-and-light!" design æsthetic, which to me just means more heat packed into a harder space to push air through and thus a shorter component-life, significantly poorer performance, and less resistance to dust/shock/whatever; but since nobody's making ultra-capable Tablet-PCs anymore (Fuj. T938 [AES/13.3"/1920×1080, i7-8650U, 16GB DDR4-2400, 256GB NVMe, no discrete GPU] = $3028), let alone with the top-end EMR (proper) digitiser tech (except perhaps Wacom themselves, melding glorious Intuos5-spec pens with truly ****ty near-doublepriced specs in their MobileStudio Pro line) and I have a system; I buy as infrequently as possible the most-capable (laptops) I can build, and it's served me well: I'm writing this on an eight-year-old purchase (loaded Fuj T901+RAM/SSD-swap) and with the exceptions of games-of-the-past-few-years and video-conversion tasks, it still does a remarkably wide range of things amazingly-well, considering. It's well past time to find a replacement, however, and the writing on the wall has for some time heralded the end of the proper Tablet-PC (~capable+convertible) era, and to be honest I figured the only way I was going to really be able to do this again was to build a crappy-monitored 'gaming-laptop' as well as a Cintiq. I well recognize I'm not getting near either in the HP but once the bastards let me see pricing I'm pretty sure I'm going to pull the trigger. The display alone is going to be a magically-delicious bonus, but that also brings up the biggest questions I have about the whole 'ZBOOK PREMIUM SUITE' (a six-product spread⁈): can I outfit all of these mothers with the Wacom AES pen? Because if so, I'd easily sacrifice the foldover/non-rotating 'convertible' modes for either the much-roomier chassis of the ZBook Studio or, better still, the roomier+larger+improved-coolinged generic ZBook 17: I haven't actually used the foldover 'Tablet Mode' near enough to justify it at the sacrifice of a bigger, sturdier, cooler, sounder, better chassis. Even on the run, I'm more comfortable having the keyboard at hand and balancing the thing to support drawings/annotation/whatever. Ugh, I get tired, you know? I'm old, I'm spent, I'm depressed, and I just f██kin' get tired. I can find three-and-a-half, four grand to drop on this a lot easier than I can justify havin' something better to look forward to. The machine's too big a part of my 'life' anymore to stay this picky about. Right? I mean, honestly, what competitors does this machine have, even ignoring the vaunted display? Competition meaning something with (or working-with, as looks to be the case here) a comparable stylus? If you want a 17" pen device there's the Lenovo ThinkPad P70, but compared to the ZBook Studio x360 it's not a convertible, it's two CPU generations behind, it's a GPU generation behind (although its GPU is possibly faster in some tasks), it has AES 1.0 without tilt, it doesn't have built-in 10-bit color support, and it has only about 80% Adobe RGB color gamut coverage as opposed to the ZBook's 100%. The direct competitors are compared here. Dell promised the XPS 15 2-in-1 9575 has 100% Adobe RGB coverage and only delivered 72%, so I wouldn't buy it out of principle. I'd avoid the Surface line, they always seem to have weird hardware bugs. That leaves the Yoga and the Spectre, which are both fine machines but they do not have 10-bit color support. what is the advantage of going with an AES pen? Maybe it works better as far as palm rejection is concerned? The only advantage is that in the future AES might be compatible with USI while EMR will never be. Everything else is down to implementation: its tilt can be good (like Apple Pencil) or bad (like Surface tilt pen) or absent; it can have a 60Hz or 120Hz or better polling rate (like Apple Pencil); and it can have good (Wacom AES) or bad (like Surface tilt pen) palm detection; it can have good pens that are sensitive down to a one-gram force or bad ones that are only sensitive down to 10 gram-force. The biggest disadvantage is that AES will always need its own power source (either a capacitor or a battery) unlike EMR that powers itself from the digitizer's... EMR. The ZBook Studio x360 will probably use the same Wacom AES 2.0 implementation as the Dell XPS 15 2-in-1 9575.